Many years ago I used to work at a McDonalds. In fact I even got refused a job at a McDonalds because I wasn’t considering it as a career. Still, I haven’t held either of these facts against them and still occasionally eat their breakfasts. 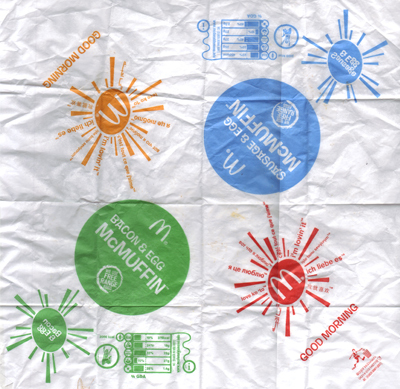 On my latest trip I noticed a neat solution in the wrapping used for McMuffins. Back in my day there were different wrappers for sausage and bacon but it would seem that with the aid of some fancy wrapping, they’ve rationalized. I’d like to think it was an environmental move but I presume they use the same number of wrappers regardless of what they look like. Of course, I’m sure they provide training on using the new design. Apart from having to amend content of the staff training manuals, I believe that the rationalisation could have brought about a few benefits in terms of business processes and general efficiencies. One wrapper instead of two: halves the number of stock lines to manage, ship to outlet and provide space for on the food wrapping benches; increases the production run length, reducing unit cost; etc. Cheers, Al.